It IS curious...I'll admit. It isn't like anyone has been able to discredit this story. If it's not what I proposed above...it must be that there is enormous pressure being applied from someplace that is powerful enough to apply that much pressure on that diverse an array of ideologically-based media outlets. I don't know of any entity that powerful. And if there IS some force out there that powerful and that widely influential...then Combetta is a 'dead man'...PERIOD. ...diverse an array of ideologically-based media outlets. If they are not reporting on this story, perhaps that's a clue that they aren't ideologically diverse, at all. You cannot control stories if you cannot control all sides of the story, to some significant degree. Drudge, for example...I've seen Drudge not publish valid, credible stories and opt, instead, for publishing stories that undermine truths that are inconvenient for Democrats. I think he is. If he doesn't give up what he knows now -- when he has the chance -- he won't be allowed to walk around four years from now when, I believe, Hillary will be running for a second term. He'll be safe for a while...but they will take care of that loose end, at some point. I wonder if it will be brought up tomorrow at the Judiciary Meeting, Both Gowdy and Chaffitz have been hot on this the whole time. I imagine the dems will just drone on from the standard playbook, as per their usual. The #StoneTear hashtag is still being hit, though the frequency has gone down a little it is now well established in the twitterverse and there is utter silence in the media on it and Hillary's defenders have nothing to say on any of the threads related to it. 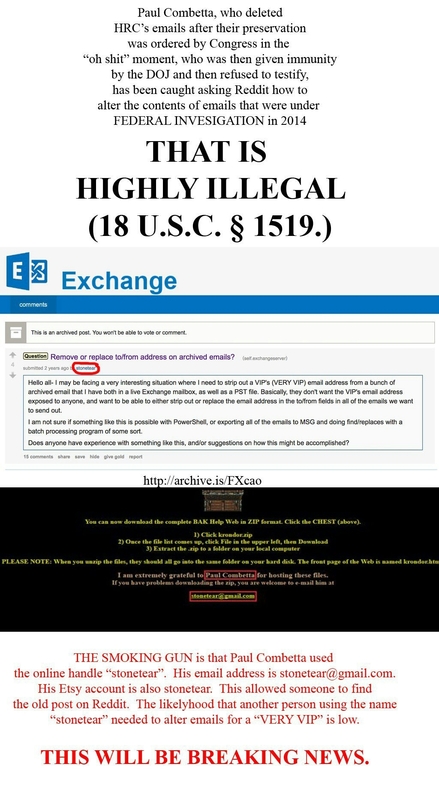 The social-media website Reddit has agreed to cooperate with a congressional order to preserve copies of posts to determine whether an IT employee asked for advice on how to strip Hillary Clinton’s email address from her emails. This sounds like Reddit still has the posts that stonetear though he deleted. And if they've got that, they've also got the ip logs of when it was done. looks like this was posted 5 days ago, I did not notice that on my first read through of the article. That does not negate the last portion of my comment though. 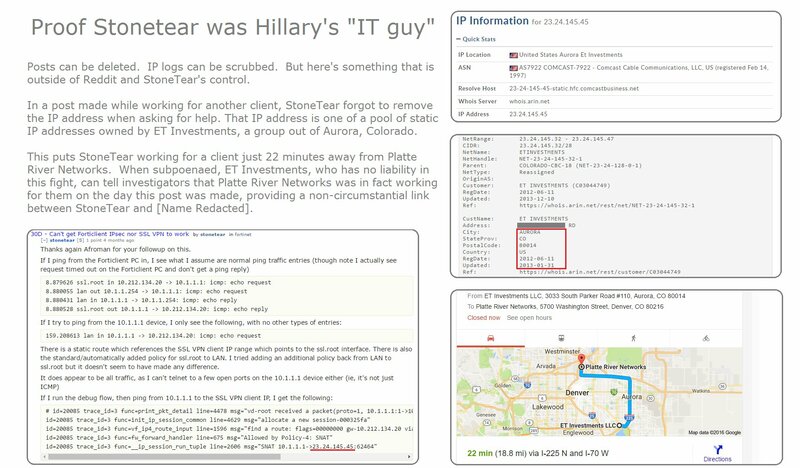 StoneTear is a "Game Over, Man" situation for the election...and the MSM isn't yet ready to quit playing (and making more money) from Hillary and Donald.